NORMAN, RAZZLE & DAZZLE - Pygmy goats. These 3 sweeties came to us from the same breeder at the same time. They were our very first goats to make God's Little Critters their forever home. GABRIELLE - Nubian/Pygmy cross goat. We named this little guy Gabrielle because he has the shape of angel wings across his back. 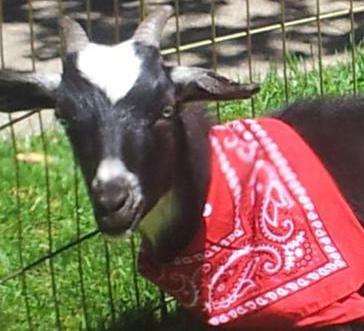 BATMAN - Boer goat. Batman was given to us by a sweet couple. We were visiting their farm the day he was born. I thought he was the prettiest jet black little boy. When he was weaned, they gifted me with him. ROCKY - Nigerian Dwarf cross goat. Rocky came to live with us from another petting zoo. 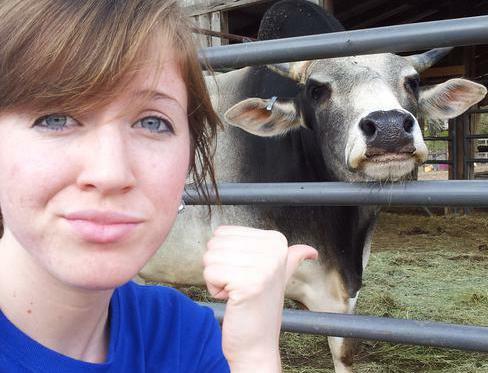 I was visiting their farm and Rocky kept jumping up on me. I could not deny him and brought him home with me that same day. 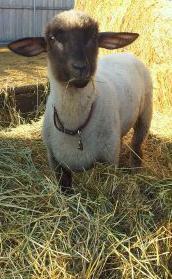 DEWEY - Nigerian Dwarf goat. I saw Dewey being advertised on Craigslist. He had the sweetest face and bright blue eyes. My husband and I drove 4 hours roundtrip to pick up this little guy. STRIKER - Boer goat. Striker was born triplets. Shortly after giving birth, their mommy died. Two of the boys had been placed and we brought Striker home to bottle feed. Brazos (you'll read about him below) came to live with us right afterwards, and Striker and Brazos became big buddies. 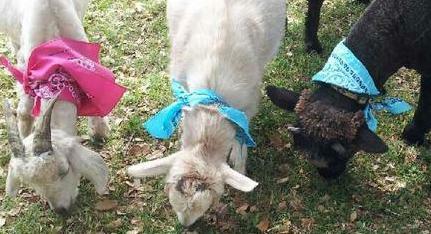 ANGELO, RAPHAEL & SKYLER - Angora goats. These three little guys came to live with us at different times from different farms. They are all different colors and Skyler has steel blue eyes. 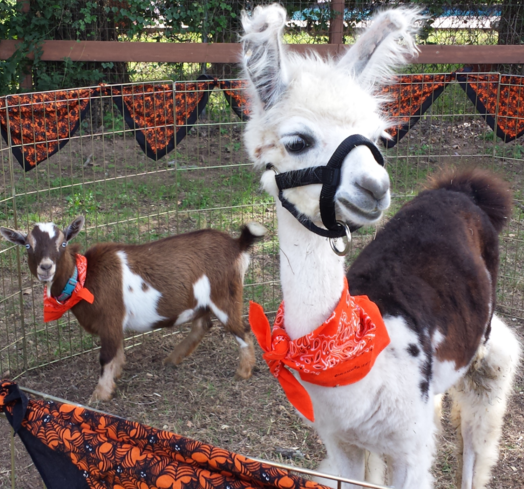 LUCAS, NEWMAN & RINGO - Nigerian Dwarf goats - These cute little boys were our 2014 Spring babies. Newman & Ringo came from the same breeder and Lucas was a bottle baby from another breeder. 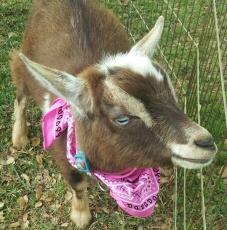 PATCHES - Nigerian Dwarf goat - I saw this colorful little guy on Craigslist for sale. He was two days old and had the sweetest face and bright blue eyes. I brought him home and he has since been on the cover of the Waxahachie NOW Magazine. CORKY - Barbado Lamb. 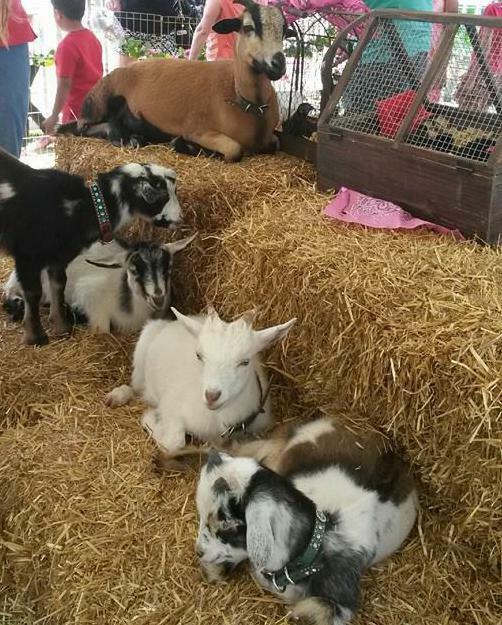 Although Corky is not a goat, he came to live with us in Spring 2014 with all the goat babies pictured here. They are all best friends and always travel together when we have events. CHRISTIAN - Lamb. Christian came to us at 1 day old...a struggling for life little boy. He was born on a cold wintry day and his mother rejected him. 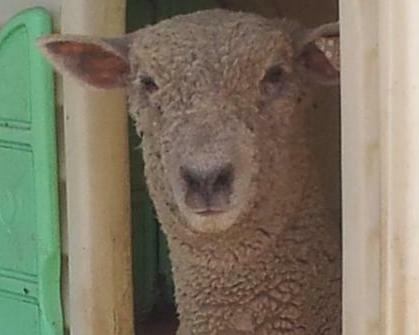 Christian was the very first lamb and one of the first pets to make his forever home with God's Little Critters. FAITH - Lamb - I chose Faith to come live with us to become Christian's friend. Because Christian was raised in the house and knew nothing of living with other lambs, he ignored her. But Faith fell for Christian and followed him everywhere. Faith still looks to Christian for leadership and Christian has now accepted her friendship. 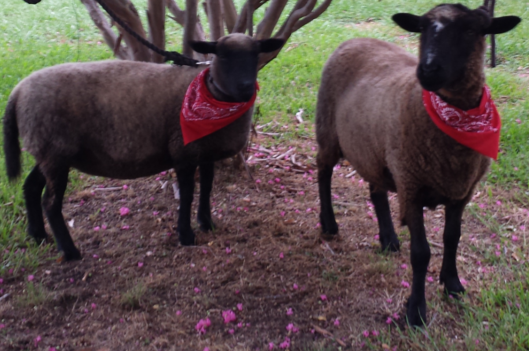 Moose & Hope - Lambs - These lambs came from another petting zoo. Moose was an extra lamb who needed a forever home. 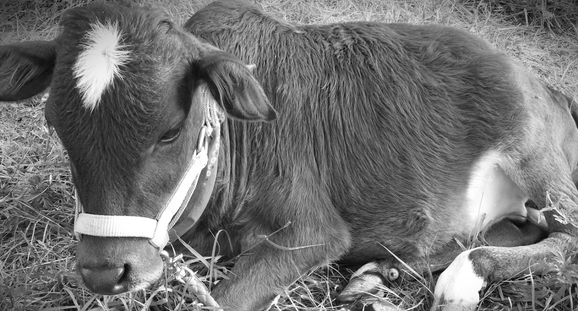 Hope had complications in giving birth and came to live with us to never be bred again. The financial responsibility of caring for our pets is great. If you feel led in your heart to help God's Little Critters in its ministry and in the care of its pets, you can read below about each pet and how you can help. Thank you! 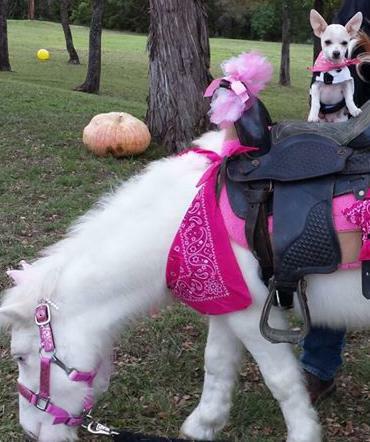 TOPPER, miniature horse - Our very first riding pony to come to God's Little Critters. We are now life-long friends with the lady who gifted him to us. 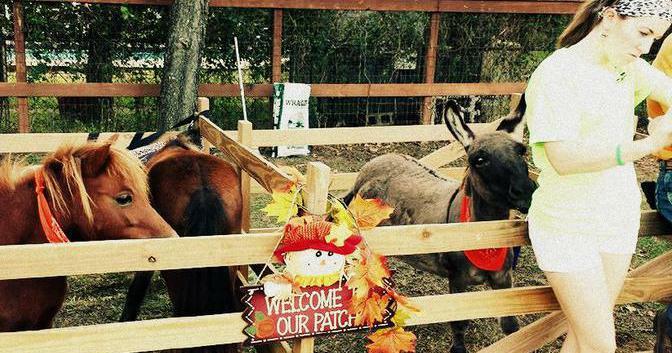 SASSY, PENELOPE, GIZMO, miniature horses & SNICKERS, miniature donkey -These sweeties came from another petting zoo who didn't see how precious they each are. BEANIE BABY, miniature horse - She came to us from a friend who purchased a herd of minis. She was so tiny she looked like a Beanie Baby. 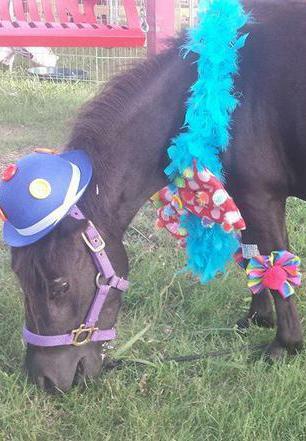 TINKERBELL, miniature horse - She came to us from the same friend who had Beanie Baby. Tinkerbell is blind in one eye and our friend wanted to be sure she went to a forever home. SPIRIT, miniature horse - He came from the same friend who had Beanie Baby. Spirit was mistreated by his owner and attacked by a dog at a young age. He was not trusting when he came to my friend. She trained him and loved him. Spirit has made his forever home with God's Little Critters. COWBOY, Quarter pony - He came to us from the same friend who had Beanie Baby. He had been bought at an auction for her nephew, but her nephew didn't want to give up the smaller pony he was riding. So Cowboy found his way to us. 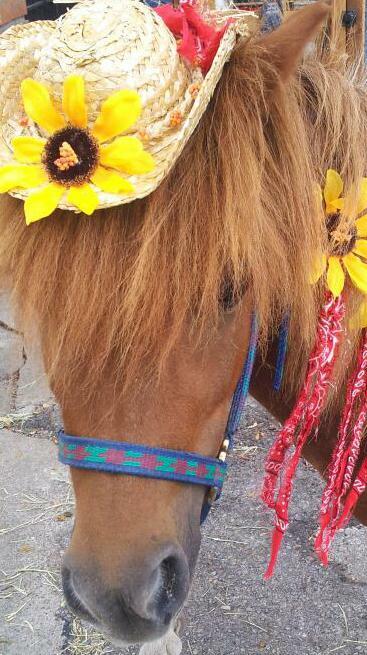 BUTTERCUP, Shetland pony - I saw Buttercup on Craigslist being sold by a horse trader. She had belonged to a lady who had several ponies as pets and needed to sell a couple. Don't know why the lady chose Buttercup to sell over another...she is beautiful and gentle. BRANDI, Welsh pony - I saw Brandi on Craigslist being sold by a breeder. She was an untrained 3 year old, but she caught my attention and I couldn't get her off my mind. Away we went and brought her home the same day. CHA CHA, Welsh pony - I met Cha Cha when I bought Brandi. I went back later for her. Guess it was just meant to be. GERONIMO, Welsh pony - I saw Geronimo on Craigslist. He was a beautiful pony but something about him said he needed us. Turns out he needed extra care and attention. A blessing that his eyes met mine on Craigslist. BEAUTY, Welsh pony - We went to a horse auction with friends. We weren't there to buy anything, just hang out with horsey friends. This cute little black mare was there with a one day old baby on her side. At auctions, there is always a concern about the baby being sold off separate from its mommy. So a friend and I bought the pair. My friend took them home and when the baby was weaned, Beauty came home to us. 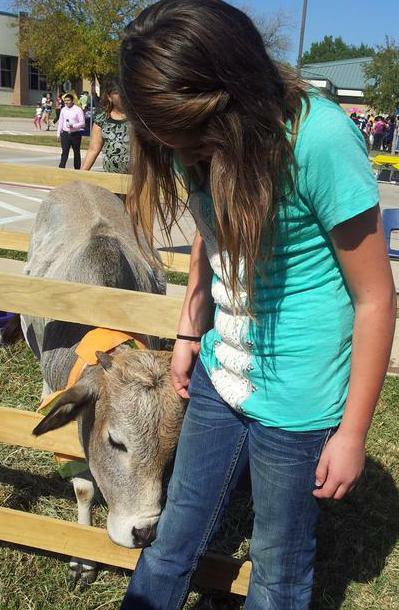 ELIJAH, miniature donkey - Elijah was a rescue. Someone else had rescued him and a miniature horse together. When they put him up for adoption, we drove the 3 hour roundtrip to pick him up. Elijah is 24" tall and the cutest little package of sweetness ever. LUCILU - We received a call from a breeder that LuciLu was a crippled Boer goat that they wanted to place in a forever home. We brought her home and within a few months LuciLu was walking on all 4 legs. BRAZOS - This sweet boy came to live with us when he was only but one day old to bottle feed. Poor little guy had Backward Knee Syndrome. When he stood, his knees bent backwards and were just above the ground when he walked. I was told it would be okay in about a week when his joints strengthened, but it was actually about a month when his legs began to straighten. Happy times! REVELER came to live with us when a young lady was graduating high school and moving away for college. She showed Reveler her Senior year and they won Grand Champion. Shortly after Reveler came to us, we received a call asking if we would take TUFF also. Tuff's momma was hit by a car when Tuff, only 4 weeks old, crossed the road and she went after him. Reveler is Tuff's daddy and they now live together. 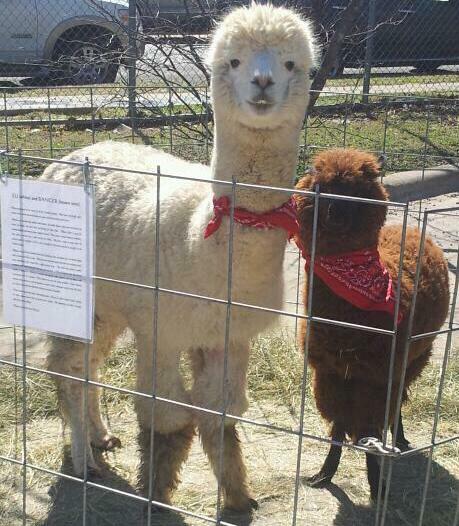 BRIENDEL was rescued with 4 other llamas from a shooting spree when the owner no longer wanted his herd of 30-40 llamas. Briendel has a birth deformity in his back leg and walks with a limp so he was of no use to many. Can't imagine God's Little Critters ministry without him. Eli & Ranger came to live with us after meeting their special person who needed to rehome them. Eli has been shown and has awards and Ranger was one of many rescues. Ranger has since crossed the Rainbow Bridge and we miss him dearly. I just couldn't bring myself to post a picture of Eli without his buddy, precious Ranger. Pheonix came to live with us when he was only 4 months old. He came in a group of other babies and he was offered to us. Pheonix was pretty skittish after being removed from his mother and knowing of nothing else. I spent a lot of time with Pheonix to give him comfort and now, instead of being scared, he gives kisses. Diesel came to live with us from another petting zoo when he was six weeks old. 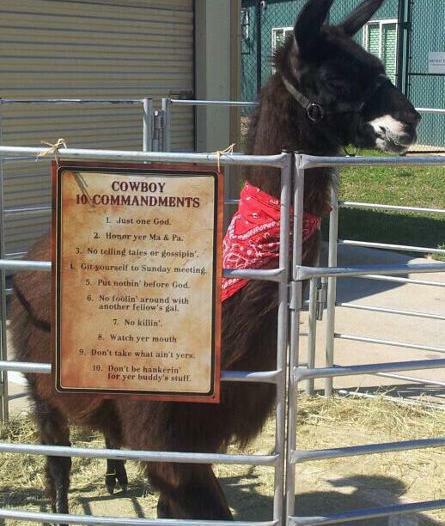 He had not been handled and was an awnry little fella. For no reason, he would just reach over to bite our hands. 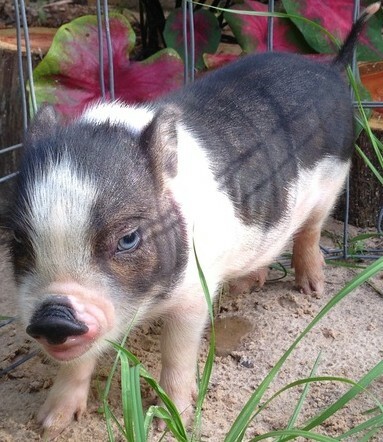 But that little Diesel grew to be the sweetest piggy ever and he loves attention. Mikey came to live with us from another petting zoo when he was six weeks old. Mikey has always been a sweet boy and loves everyone. He is a great piggy for kiss-a-pig events...he gives big smooches. Blue Boy was six weeks old when we drove the 4 hour roundtrip to pick him up from a breeder. He has the brightest blue eyes and you can tell what he is thinking through them. Blue Boy has such a fun personality and is most definitely the most mischievous little piggy on the farm. Valentine was eight months old when he came to live with us. His previous owner did not have time for him and he was spending the majority of his days in a kennel. Now he has room to roam and play. Valentine is a very laid back piggy with a quiet and most sweet personality.